Xvirus Personal Firewall PRO is a lightweight, easy-to-use firewall for Windows. With features such as blocking untrusted programs, network monitor, ransom checker, and cloud check, Xvirus Personal Firewall PRO provides you with everything you need for additional protection against hackers — without slowing down your computer. It doesn’t even come close to as good as my all -time favorite, Sygate. However, it’s not bad if you want a simple firewall. If you need something with more options, don’t even bother. A crappy VB.NET-made app with most of it’s source code available on the internet for everyone to use. Also, you can see its source code with any .NET decompiler. A firewall is a system designed to prevent unauthorized access to or from a private network. Some hackers may be after your high-speed connection so that they can send malicious viruses and worms, blackening your reputation. Other intruders have the power to destroy your operating system on a whim. Firewalls provide security over a number of online threats such as Remote login, Trojan backdoors, Session hijacking, DOS & DDOS attacks, viruses, cookie stealing and many more. Xvirus Personal Firewall is a simple application designed to enable the users to check all active connections and control which are granted access or not. It can monitor incoming and outgoing traffic and blacklist applications from connecting to the Internet. It can work alongside the Windows native firewall. The installer size is ~2MB and the installation process is simple and straightforward, taking no time at all to complete. The application does require .NET Framework installed for it to work. Users with newer versions of windows should have no problem as these components come already installed. Once installed, you can easily enter the license key you have to activate the PRO version. Once done, you can see the application UI, and start using it to manage applications that try to connect to the internet. Firewall protection comes already activated, so as soon as the application is launched it starts showing pop ups whenever a new application or service is trying to connect to the internet. You can activate Proactive protection and tweak further settings. The interface is clean, simple and not complicated at all. All the options are neatly organized in an appealing layout that makes the application easy to use and understand by all types of users. On top it displays the current security state of the system according to its assessment. Under it you can see the state of Firewall protection and Proactive protection. Following it, there are three buttons under, one which shows you and lets you monitor network activity, one that checks for updates, and the last one that takes you to the settings menu. Network monitor let’s you terminate processes, add them to blacklist, or whitelist them. In the settings menu you can change settings like, enable ransom watcher, Xvirus cloud check, memory watcher, silent mode, password protection, choose different modes, and enable/disable automatic updates. You can also change, add and remove different firewall rules, and check log of activity. Language of the UI can also be changed. – Simple and user friendly GUI. – Supports many different languages like English, Dutch, Hindi, Spanish, and more. – Works alongside and is compatible with Windows Firewall. – Ransome watcher automatically shuts dows ransomware services and processes. – Anti-Ransomware Vault can be used to restore backed up files if needed after a ransomware attack. – Memory watcher enables you to monitor and detect activity of unknown processes. – Handy and convenient pop up notifications that allow you to Allow/Block any process or service attempt to connect to the internet. – Comes with presets that have important Windows services already whitelisted. – Auto mode comes with two settings High and Low. – Keeps logs of all the activity and actions. – Runs into errors and crashes a couple of times. – Errors pop up when attempting to block a few processes. Xvirus Personal Firewall is a small yet reliable and powerfull application, that allows you to take control of all the internet activity of your PC. It puts you in control and let’s you decide what goes through (whitelist) and what is blocked (blacklist). The application runs smoothly, and system resource usage is low to moderate. It does run into a coupld of errors and crashes here and there, but it does it job well. It is definitely recommended. I used the giveaway for this last time and liked it so much I purchased a lifetime license. I have it set to work silent and automatically without needing to be an expert at anything PC which I am not (easy to set it and forget it). The customer service is beyond outstanding, there are updates after purchase of course and it is super affordable for the lifetime purchase. Well I like it. It goes further and offers more in protection than the windows own firewall service. It is almost a far-gone conclusion that a security providing application should be full of features and heavy. However, that is not entirely true based on the Xvirus Personal Firewall PRO software. This program comes across as a lightweight solution for protecting yourself from the internet-based threats and problems like ransomware, untrusted programs, and hackers. I had my hands on the program and here is what I found. Right from the download and installation process, the program’s small size had me thinking that it will be less effective in achieving its functions. However, on running it, you will get a bunch of helpful features and options that the simple user interface will encourage you to try out. If your machine does not have the dot net framework already installed, then Xvirus Personal Firewall PRO may not work smoothly as expected. If you prefer minimalistic user interfaces, then this program will definitely appeal to you. The arrangement of the options has ensured a nice distribution hence eliminating any chances of having a clustered UI. Apart from the nice UI, it is easy to understand what each option performs. Further, you may also find the pre-define security options helpful. The core functionality of Xvirus Personal Firewall PRO hinges on its ability to access all the programs involved during an active network connection. As such, you can have a quick look at what is running. In addition to such informative details, the program goes ahead to give you the option to disable or re-enable processes based on what you want. It is always a good thing when an application gives you simple options to block or allow certain processes. As I was exploring the blacklisting and whitelisting option that the program provides, I experienced several error messages that I would term as irritating. In turn, the errors planted the seed of doubt on whether Xvirus Personal Firewall PRO is really effective in executing its functions. Although it is pretty straightforward on how you can block certain network-based processes while using this program, you will have to go through the hard work of searching for those processes. Clearly, such experience may be bothering especially if you do not know the specific processes you want to blacklist. Xvirus Personal Firewall PRO will provide you with a simple way of blocking certain malicious network processes. However, the option may require you to know what to look for before performing the blacklisting. Further, the program lacks depth in terms of analyzing or sorting malicious processes for easy blocking. The lightweight nature of the package may, however, encourage you into downloading it. Xvirus Personal Firewall is a simple application designed to give an idea of all active internet connections. The Network Monitor gives you absolute control over active connections and gives you the power to deny or block specific connections. This is taking the malware fight offensive by actively denying malicious connections before they can do any harm to your computer. 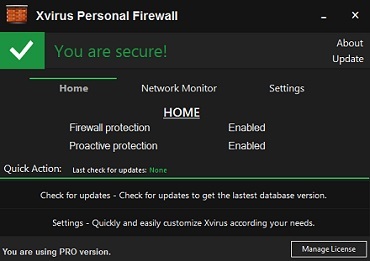 Xvirus Personal Firewall installer is designed to run out of the box. It comes pre-configured with the ideal security settings. It will not bother you – especially if you have .NET Framework up and running in your system. The minimalistic no-jokes design proliferates the settings tab. I found the simple firewall settings options, especially the proactive settings and the Rule List quite efficient for quick management. The minimalistic approach might be a bother if you are running Xvirus on a proxy server or dedicated firewall machine but won’t be any trouble to the limited connections your computer makes with remote nodes. Even though Xvirus will come with settings in place, it is up to you to decide the denied and disallowed connections. The simple white/blacklist comes in handy regardless of how you want to approach your security. If you prefer accessing specific websites, you will use the whitelist. If you want to block some, use the blacklist. The name is a bit misleading. The ‘virus’ aspect made me think that Xvirus will help me identify the connections to block. Well, it doesn’t. It is up to you to find out. I expected the Network Monitor interface to offer an assessment of each available connection. All I got was the process IDs, IPs and ports. Even though this is useful information to someone conversant with networking, it is, well, just digits to the regular PC user. Don’t let the ‘virus’ in Xvirus fool you. This isn’t a virus parse. It is a connection control tool that will only work if you know what to whitelist and what to blacklist. That aside, it makes an amazing lightweight firewall tool that works excellent on a personal computer.